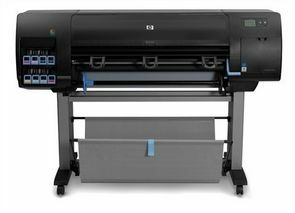 HP Z6200 42" Photo Printer , with a significant increase in speed & quality over the old version Z6100 the NEW Designjet Z6200 delivers exceptional class leading productivity with the added benefit of superior large format colour output. The HP Z6200 Why Upgrade or Change ? 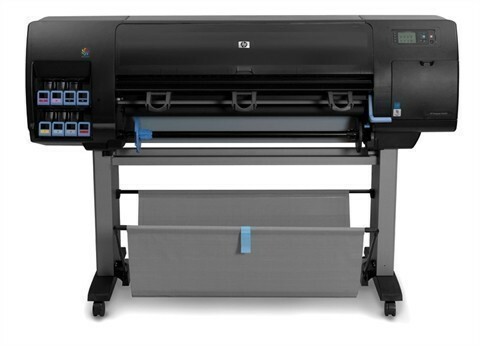 The HP 771 ink system with it's new polymer based ink offers a broader colour gamut, the 8 colour system has a new chromatic red for a reduced bronzing along with a darker gray than the previous model providing vivid colour output and more consistent deeper blacks allowing for longer smoother output which is ideal for pop up's for instance. The polymer base also makes the prints more durable with much increased resistance to scratch. Additionally the new 771 ink reduces cost with more dynamic ink use, HP estimate an average saving of 9% based on a cross section of various output types. Additionally HP have introduced a Postscript upgrade kit negating the need to buy a postscript printer upfront, you can simply buy this accessory at anytime giving you more file functionality. Wide colour gamut enabled by chromatic red ink and uniform gloss you can take on the toughest of production photo printing challenges. Make life more easy with automated media loading & an integrated ergonomic loading table. technology features that help you operate with ease. Trade in and Trade Up your old equipment without compromise by using printer emulation functionality.